If you are looking for a way to carry either AK or AR 20 round magazines our chest rigs can be cut down to make a low profile chest rig even more low profile. 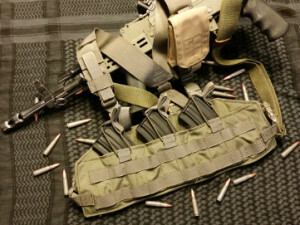 The above chest rig is our AK47 TAP chest rig cut down to hold the smaller 20 round AK47 mags. Three mags in the chest rig and one in the weapon gives you a combined total of 80 rounds. Smaller package, lighter load and plenty of fire power. The weapon is a Hungarian AMD65 built by Never Enough Guns on a surplus parts kit,Hogue AK pistol grip,Tromix Enlarged Charging Handle, AMD65TECH cheek riser and refinished by using Alumahyde 2 od green. 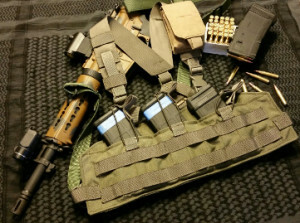 Just like our AK rigs our AR TAP chest rig can be cut down as well to hold the smaller and lighter 20round magazine. The AR is a Palmetto State Armory 12″ upper chambered in 556 Anderson Manufacturing lower,.tlr3 streamlight on the A2 front sight,B5 carbine length handguard,magpul k2+ pistol grip,magpul moe buttstock,magpul gen 2 mbus rear sight,larue tactical LT660 micro red dot mount with a Primary Arms micro red dot,custom paint job was done using Aervoe Field Drab and Alumahyde 2 dark parkerized grey. Contact us if you are looking to carry these smaller 20 round mags. The 20round chest rigs are available in: MultiCam, MultiCam Black, A-TACS AU, A-TACS FG, Kryptek Highlander, Kryptek Mandrake, Kryptek Typhon, Coyote, Khaki, Ranger Green, OD, Wolf Grey, Woodland and Black. 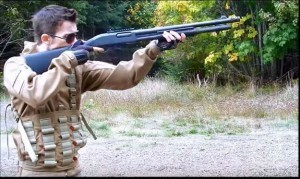 Survival life ran our tactical shotgun shell chest rig and provided us a review and video. Here is the survival life article link.